When undergoing an office move, renovation, or transformation, strategic project management is key, making choosing the right partner one of your most important decisions. With so many moving parts, it is critical to plan up-front and communicate proactively with all stakeholders to best manage potential road blocks such as project delays or scope creep. Since furniture is often the last trade in a construction project, our project managers deal with compressed schedules. Being nimble and able to creatively problem solve is vital. At Red Thread, our project managers have seen it all. 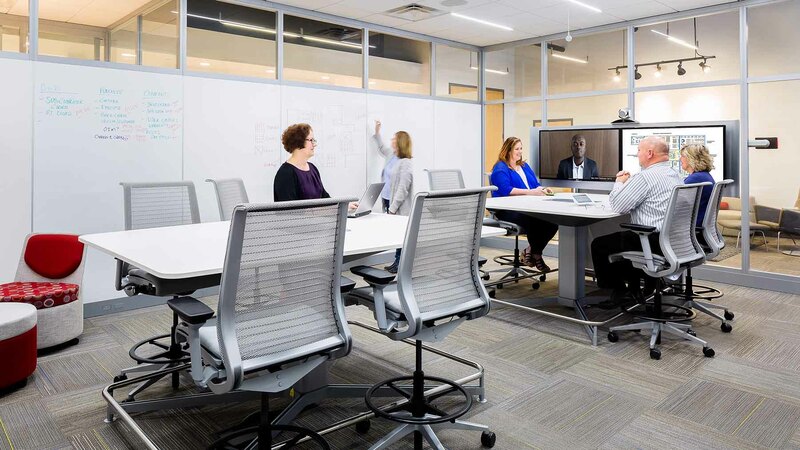 From working on large-scale office moves and renovations, to managing smaller scale refreshes, our experienced project managers tailor the process to drive successful outcomes. We have extensive experience managing workplace interiors projects and understand what it takes to fulfill your vision. Operating throughout New England, we have 3 warehouses, a 90 vehicle truck fleet, resources and facilities to support large multi-phase projects. Red Thread proactively communicates with all stakeholders throughout a project. When we are involved in the process from start to finish, we can be proactive and resolve potential issues before they become challenges. Our project managers are not only constantly collaborating internally with our teams, but they understand the importance of building outside relationships with our project partners. We have developed consistent and effective methodologies that allow us to manage all of the details as efficiently as possible, driving consistent results. Even with the best upfront planning, issues can arise along the way. Our approach is one where we anticipate as much as possible, being proactive to solve any problems before they arise. Here are a few examples of how Red Thread has done this in the past. We were working on a large-scale installation and monitoring construction progress very closely by attending weekly construction meetings. As our installation date approached, it became clear the floors and ceilings were not going to be ready on time for us to proceed. Knowing our schedule would be much tighter, we completely re-tooled the sequencing and decided to pre-assemble what we could. Our team had to bring to site multiple deliveries a day and during overtime hours sequencing the placing of furniture in the space as construction was completed. Being able to foresee the construction delays allowed us to revise our plan, completing a typical 7 day installation in just 3 days to meet the customer move in date. With unexpected construction delays on a Boston project, our team was facing a very compressed schedule. Trailers of furniture were scheduled to be delivered directly to the site and rather than re-routing the trailers to the warehouse, which would have been costly for the client, we staged the furniture on site until the space was ready for our installation. We were able to allocate extra manpower from our Connecticut installation team, working around the clock in order to meet the turnover date. Creative problem solving, nimble thinking, and additional resources allowed us to complete the install on time and without additional client expenses. We were preparing to deliver height-adjustable desks for 350 workstations to a location in downtown Boston when we ran into a unique challenge. Boston was in the middle of what would become the worst winter in the city’s history, and due to massive snow banks, Boston streets were narrower than normal. Our project manager discovered the day of delivery that the loading dock, which could typically accommodate a 54-foot trailer, would not be able to fit our 53-foot truck due to snow banks. We opted to leverage temporary storage in our warehouses, offloading the desks onto smaller vehicles that same day. Our quick thinking and ability to leverage warehousing and additional vehicles allowed us to deliver according to schedule. Our project managers have seen it all when it comes to managing projects. Through years of experience we have learned that no matter the project, the principles are the same. Here we share 7 of the pillars that make Red Thread project managers so successful. Iron Out the Project Details: Nailing down the details before a project starts is key. Laying out the initial groundwork by building out a Project Overview and a Project Schedule allows you to achieve buy-in from all stakeholders and ensures the project planning is built on a mutual understanding. Select the Project Team and Determine Responsibilities: Make sure to select the right team and establish project specific roles, a communication flow, information sharing, and meeting protocols. In addition, it is important to ensure team members have complementary skills, strengths and personalities. Define Project Milestones: Developing a Critical Milestone Schedule drives decisions and helps you mitigate project risks, identify potential red flags along the way, and ensures the project remains on a successful path. Communicate: Transparency and consistent communication among all stakeholders is vital to project success. Developing and sharing deliverables such as a Defined Budget, Decision-Making Schedule, Open Issue Management Report, and a Change Order Log ensures open communication of the status on project tasks, budget, schedule and outstanding items. Proactively Manage Project Risks: Being able to anticipate issues before they become a reality is extremely important. Our project managers find that staying up-to-date on all deliverables and regularly communicating with all stakeholders and project partners helps manage potential risks. Manage Scope Creep: Understanding project goals and closely monitoring the project status helps manage any potential scope creep that may arise. If scope creep does happen, it is important to give careful consideration to any budgetary or schedule changes, keeping the overall project vision in mind. Close Out the Project: Once a project is completed, it is important to complete a thorough project closeout, resolve any punch list items and to evaluate the success and lessons learned of the project. At Red Thread, we ensure all billing has been completed, review KPIs and success measurements, and conduct a post project evaluation in order to document key learnings and celebrate successes.